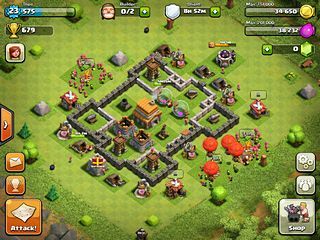 Clash of Clans is a great strategy game on your portable device! Whenever you get angry or annoyed by something or somebody you can start this game and get more territory for your clan, become more prosperous and then go back to your life! The game is really fun and entertaining. There's an aspect of a strategy as you consider where to plact your troops. The game doesn't really limit your energy as many of the same type. There's a different system, that is similar but not the same. You do depend on gold and elexir to proceed through the game. If you go too far, such great amounts of those materials are required that it takes days sometimes to collect them to proceed. You will most probably have to buy some currency to get further into the quests. You can go ahead and clash with other real players on their territory or fight goblins in the single player mode. The game is really colorful with interesting cartoonish characters. It is a great to take a break from reality for another victory for your clan!